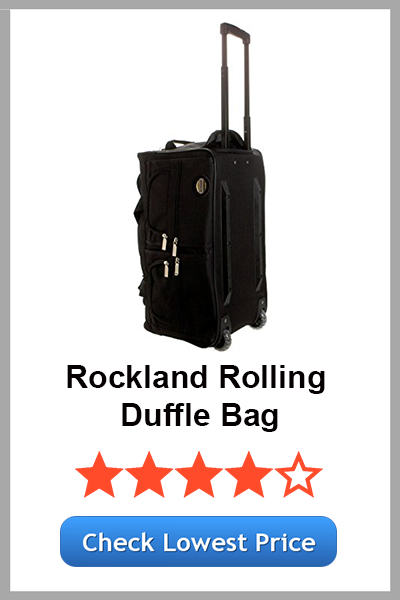 If you are a frequent traveler who travels short trips or long trips on a regular basis then best rolling duffel bag must have for you. The lightweight carry on rolling duffel bag would help you carry large and small items in the main compartment while wheels help you to roll bag in the traveling areas. After reading this article, you will find your best one which can complete your needs. Let’s jump on the list. 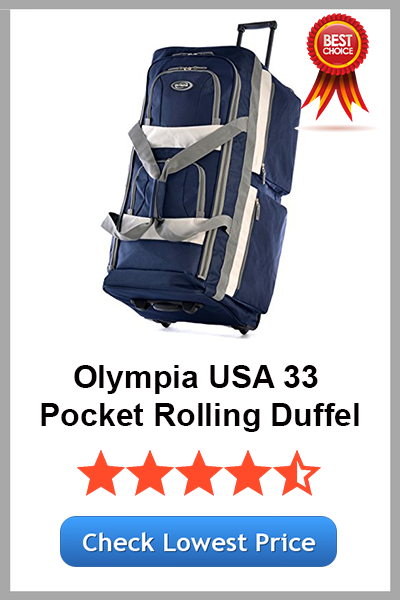 When we talk about one of the best product from the list of top duffel bags then Olympia rolling duffel would be the great option to go with. It’s very easy to carry and comfortable with any short for long run traveling trips. The most important thing about the bag is its lightweight and easy to take on and off in buses, cars, and airplanes. While searching online, I found that many people have been worried about whether the bag comes under U.S airlines guidelines. Then after researching, I found that YES the bag follows U.S airline guidelines without having to pay for oversized luggage. One of the advantages of having Olympia bag is that it comes with eight pockets and They can help you to store every small and large sized item in the pockets. It's made of 100% polyester material which is capable to resist any attacks during your traveling journey while it can be washed easily and you can choose the bag from 33 different models. It comes with extra large wheels for easy mobility and helps you to carry heavy weight items easily. Other than that, heavy duty zipper and large shaped U opening help you to access items in any uncomfortable situations anywhere. The additional four pockets at the front side help you to store additional items that can be accessed easily. Available in lots of colors and design(Fun Prints). Sturdy Construction with reinforced stitching and piping on all the corner. Best value for the size. It is strudy enough to go through the checked luggage and not break. Wheels doesn't have enough lateral support. Clip on Strap which is made of plastic is very soft. 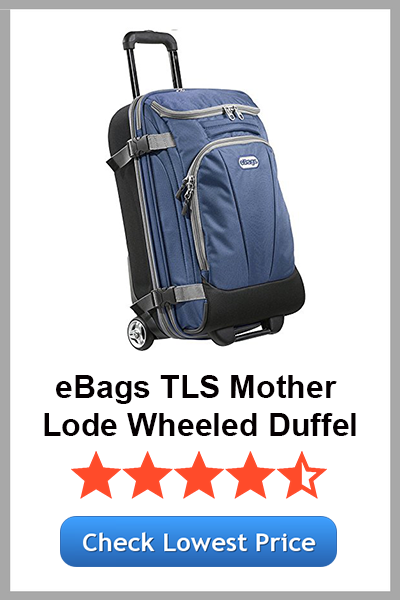 When you are looking for heavy duty steel wheels keep rolling in the long run for many years then eBags TLS Mother Lode Mini 21-Inch Wheeled Duffel would be the best choice to go with. Other premium features include YKK zipper that includes photo-reflective cords for safety in the night time. When we look at the storage part then you will get big zipper pocket for storing files and documents while small zipper pockets allow you to carry frequently used items. The main compartment can be described in two parts one is an upper compartment of 21" x 14" x 3.5" and lower compartment 21" x 14" x 5.5" with a 1.5" expansion zipper. You might be thinking why expansion zipper then they have used special technology to give you more 22.3% more packing space so you can keep more items. 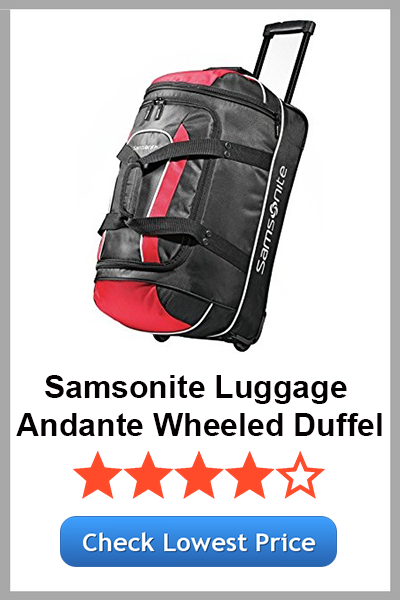 If you are looking for additional space at a cheap price then Samsonite Luggage 22-Inch Andante Wheeled Duffel can be the best option for you. It's available in six different colors from that you can choose any of your choices and the most interesting thing is all color variants have the same cost. It's made of 100% polyester material with nylon lining that improves the look of the bag and polyester material can resist attacks in any situation. When you are traveling you will need to access the content of your bag any instance then U-shaped opening helps you to access quickly. However, the lightweight nature helps you to carry bag long time on your shoulders and won't hurt shoulders and hands quickly. Multiple Pockets for storage and easy access. Perfect to take on international travel. Can easily fit in the overhead compartment of plane. Quality of plastic is cheap. 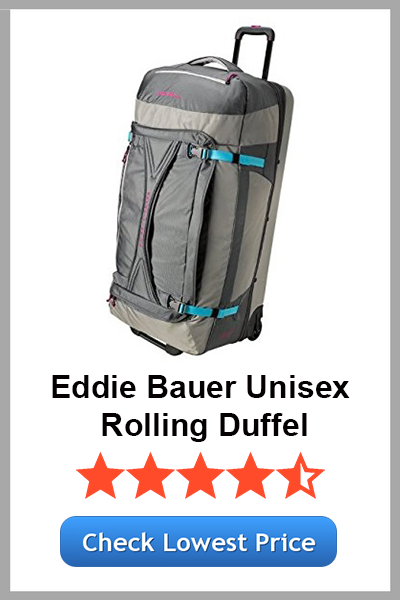 If you are looking for large sized duffel bag then I would highly recommend Eddie Bauer unisex adult expedition drop bottom rolling duffel. Available in five different color variants, It's made with two types of nylon materials ripstop and ballistic nylon for increasing strength and softness of the bag. It comes with integrated compression straps for eliminating excess loose straps and for the storage area, the main compartment is separated into two zippered section to put items in an organized way. Seperate compartment underneath main compartment which can fit shoes. 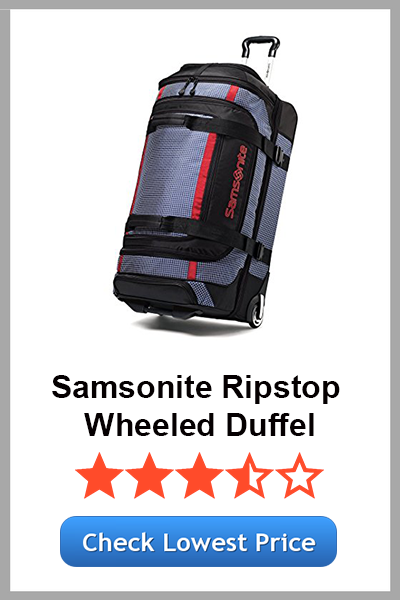 If you want lightweight rolling duffel bag of more than 30 inches then Samsonite luggage 35 inches may be the best option for you. When we were searching reviews of this bag we found that after traveling many flights of longer trips for around 9-10 days, the bag was in the excellent condition. You can easily store two-three pair shoes with clothes of various whether easily then also you will have some room to store important documents and other small items. The suitcase itself lightweight in nature and follow all terms and conditions of airlines. The handle can extend up to 6-9 inch from the suitcase which is enough for 5-6 feet men/women. Wheels are too small for 36L Bag. 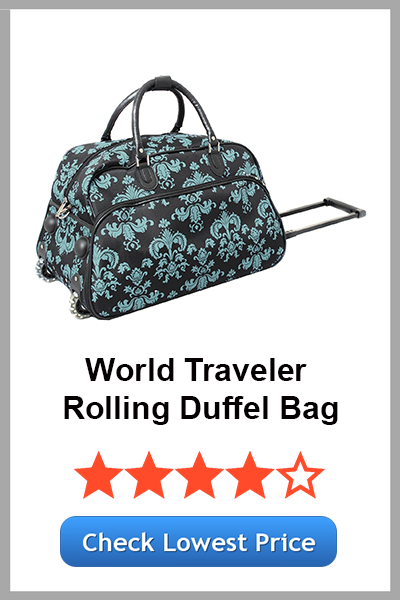 With different 30 color variants available, world traveler 21-inch rolling duffel bag is the best option to make for short trips. This bag can be easily fitted under any airlines sits. Moreover, you will have more room to keep other items alongside with lightweight rolling duffel bag. When we look at the size then It's not too big and even no too small but It's perfect for short trips of 4-5 days and 2-8 hours a day. It comes with a front pocket which is secured while five small and medium-sized interior pockets give you more flexibility to organize every item with whom you want to travel. The adjustable ergonomic shoulder strap can help you lay down a few pounds of weight from your shoulders and you won't get tired of quick time. Lots of Color options available. What if you find a bag that can work in three different modes duffel, wheeled upright and backpack. I know you are very excited to know that bag. 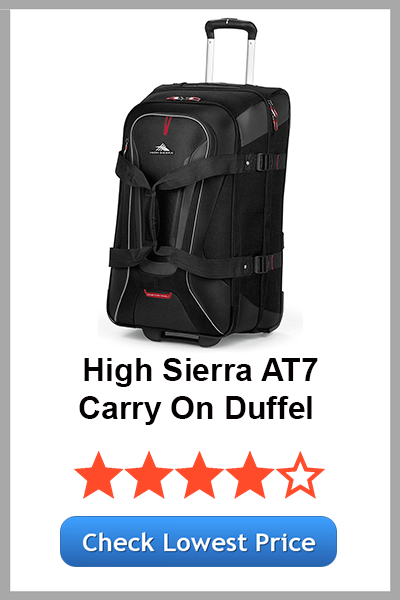 Let me present you a high Sierra AT7 wheeled duffel with backpack straps that can help you in every traveling journeys. It's available in three different sizes of 22, 26 and 32 inches while in pure black and charcoal black colors. It's made of ballistic nylon material which provides high security and strength to the bag. When you look at the storage area, you will find that main compartment has a book-style opening while interior clothing hold-down straps. The downside of the bag is It doesn't come with TSA approved lock and small TSA locks can't be reached far enough. That means you will need a lock which has a small cable component in it. You can use it as Wheeled Upright, Duffel or as a Backpack. Lots of space for stuff. Build quality is high which makes it strong to carry the bag. Loses balance when full packed. After listing down best ones here, I would recommend you Olympia and Eddie Bauer Rolling Duffel Bags if your first priority is large size. But for the frequent traveler, you can go with Samsonite and Rockland brand bags. I hope you loved this article, If so, then don't forget to share with friends and on the social media platforms.